Last weekend gave Ben an opportunity to ride alone, as on Saturday Sherie was with some girlfriends to ride the annual Cinderella Century. The Cinderella is a women only ride, a rolling costume party, a fairly flat metric century in the East Bay valleys. Each year, Sherie rides and comments on how many inexperience riders make it a bit dicey on the road, and wonders if she will ride it again next year. But each year, when she recieves her email link to register again, she does. And she enjoys dressing up for the ride and sharing a day with girlfriends on the roads. So Ben had choices. 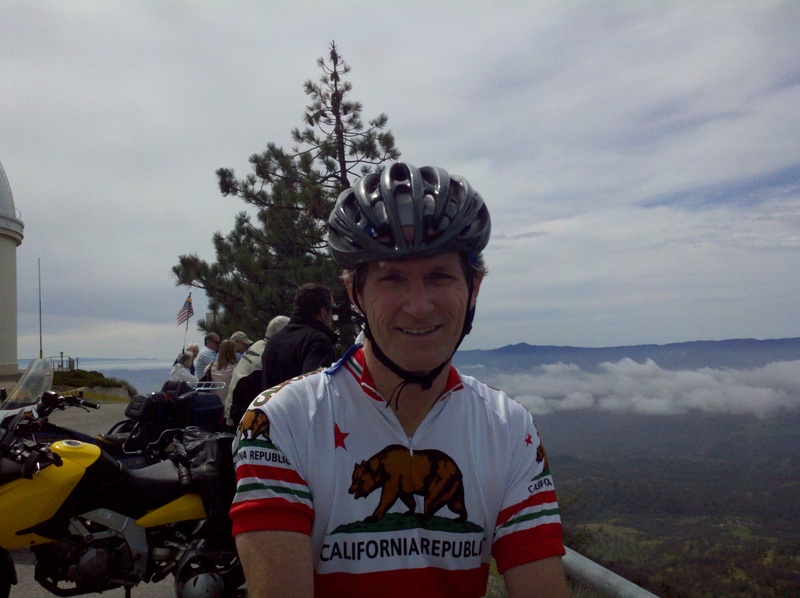 He considered some club rides that might be approriate, and looked at the schedule for the upcoming weeks, and decided that it was a chance to climb Mt. Hamilton before the hot weather starts in a few weeks. As the planned club ascent that Ben and Sherie were to lead a few weeks back was rained out, he had a start point and route sheet already set up. Mt. Hamilton is the highest peak in the SF Bay Area; astronomers at UC Berkeley had set up large telescopes there in the 1800s. 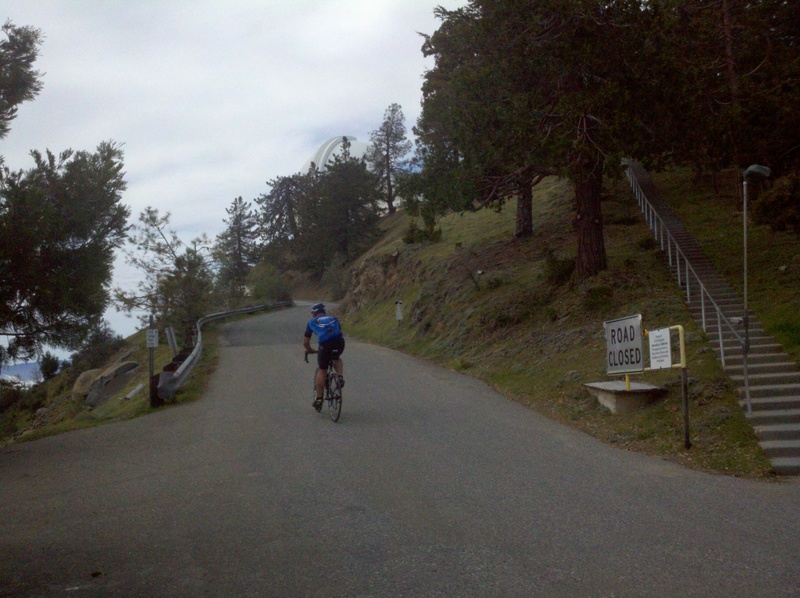 The modern highway is a legacy to Lick Observatory, a steady climb laid out to allow horses to haul large mirrors and metal framework up to over 4000 feet. This makes it an ideal bicycle route of about 20 miles of climbing, with long steady climbs at a moderate 6% to 7%. Ben found that the climb from the west is broken into three segments, each a bit steeper than the previous. The first is maybe five miles on a climbing ramp with the Santa Clara Valley to the cyclists right from the Alum Rock neighborhood of San Jose. Auto traffic quickly thins out as you climb past the modern McMansions of new wealth with the occasional older funky place to gain the ridge top and enter an oak forest. The grade is pretty easy and Ben could hold a strong pace without using his new lower gears. By the way, to prepare for the Dolomites, Ben succumbed to installing a new cassette on his Lemond titanium road bike. With a 28 tooth largest sprocket instead of his old 25, Ben has that one more gear in reserve for the steepest climbs or tired legs at the end of a long ride. For those who care, Ben rides a triple ring Ultegra crank (52-40-30) with a SRAM cassette (11-28). Deraillers, brakes, etc are all Ultegra. 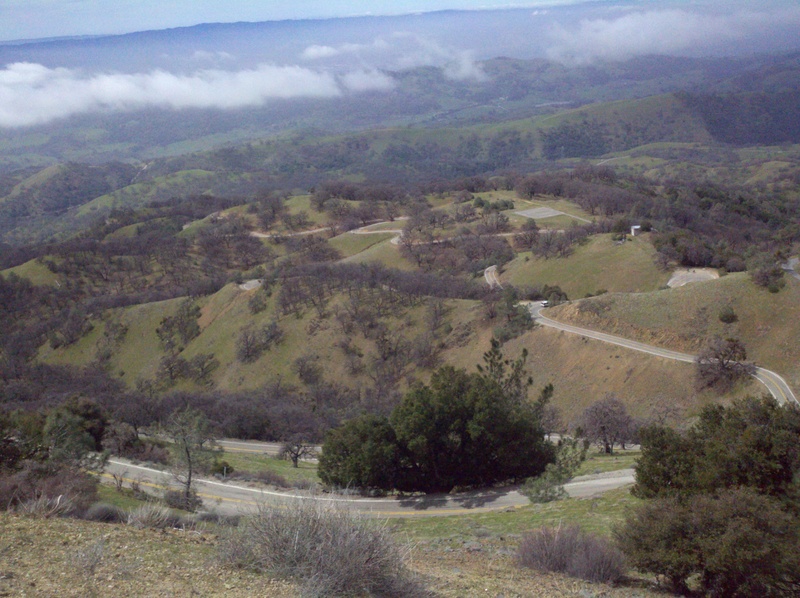 Back to the ride: the second segment is introduced after a short descent toward an old ranch or two before the road finds the next ridge and resumes a steady climb. While a bit steeper than the first ridge, this too is never too tough, just steady without surprises in grade as one rounds ridge lines and hairpin turns. The oaks thin a bit and one gets views into the valley, pretty views with natural landscape for miles. Eventually one rounds a corner and begins another short descent to a bridge at a park entrance to begin the last segment. This one is again about seven miles in length, but the grade is more consistently steep with fewer flatter breaks from the steady climb. Ben was begining to tighten up in the lower back/upper buttocks. Admittedly, Ben did his usual hard push uphill without stopping with the occasional change to a standing position and stretching while still riding. He refused to using that new lowest gear, just the 24 tooth second lowest. And as the climbing approached twenty miles with minimal flats the effort over two hours showed Ben the limits to his current condition for sustained climbing. As one approaches the top, the terrain changes to steeper slopes leading to the summit. There are a good dozen or more buildings within a half mile of the summit, actually on the various summits of the peak. Ben stopped where some other cyclists were resting near a hose spigot that yielded very fresh water into Ben’s nearly empty bottles. After joining in the banter for a few minutes while drinking up, Ben saddled up and road onward toward the summit. Here Ben enjoyed a break in the sunshine, enjoying the views of the hills far below. A few clouds hid the bay, but it was still spectacular. Several motorcyclists and SUV passengers all engaged in conversation. Ben was amused when the man he asked to take a picture with Ben’s Android phone struggled but his teenage passengers had no trouble taking a portrait for Ben’s archives. Just off the summit Ben talked a bit with two cyclists who had small backpacks. They pointed at the sign that listed “Patterson – 50 miles” and talked about their trip there. When Ben asked if they had a car there, they said they did not. They planned to stay overnight in a motel, then ride the reverse tomorrow back to San Jose. Their packs held flip-flops, light street clothes, and a toothbrush. Sounded like a good plan to Ben. Ben hopes to climb Mt. Hamilton from the east via Pleasanton BART and Mines Road this spring to see that wilder side of the area. The descent was long, obviously. And Ben was cold for much of it, with only a vest and armwarmers to block the windchill at 30 miles per hour for the better part of an hour. But when he neared the bottom, Ben took some alternative roads for the exploration value (Crothers Road back to Alum Rock Park and other explorations around the golf course). Ben had planned to climb Sierra Road after the descent, but only if he felt fresh. Sierra Road is known as one of the most relentless steep climb in the South Bay, but Ben’s tight back told him to save that for another day. Stats for the day: 44.64 miles, 5274 vertical feet, 218 minutes for 12.29 MPH.